Spanning over 40 years, Derek Bell MBE has enjoyed one of the most successful, diverse and wide-ranging careers of any British racing driver. He is best-known as the consummate endurance sports car driver who won the Le Mans 24 Hours five times, the Daytona 24 Hours three times and the World Sports Car Champion twice. He is considered as the greatest Englishman ever to compete in endurance racing. Derek’s sports car career spans the Ferrari 512 and Porsche 917, the Gulf-Mirage era, Renault’s turbo effort at Le Mans, the Porsche 936, Porsche 956 and 962, the Kremer Porsche K8, the Ferrari 333 SP, and the McLaren F1, which earned him yet another Le Mans podium, with his son Justin, in 1995. The latter was one of the proudest moments of his career, on a par with any of his five outright victories at the famous 24 hour race. Derek is still an ambassador for Porsche today and represents the company at many historic motor racing events. Furthermore, Bell regularly takes part in events like the Goodwood Festival of Speed, driving the same cars he used as one of the most versatile and popular racers of his generation when actively competing. With this year’s show marque being Porsche, the organisers of Classic & Supercars are delighted that Derek will be attending the show and meeting visitors and fans alike. He started out as a marshal at Goodwood, a few corners down from where the career of the great Sir Stirling Moss OBE came to a premature end in 1962. He began racing as an amateur in a Lotus 7 at Goodwood, winning his first ever race in March 1964, in the wet. He quickly progressed to Formula 3 and then Formula 2 with the backing of his step-father’s Church Farm Racing team, turning professional within three years when Enzo Ferrari offered him a Formula 2 drive in the Monza Lotteria. Between 1968 and 1974 he competed in 16 Formula 1 Grand Prix, racing for Ferrari, McLaren, Surtees and Tecno, with a single World Championship point to his credit, driving a Surtees to sixth place at the US Grand Prix, Watkins Glen, in 1970. Derek’s real talent lay with endurance racing, where he has become a legend. He won back to back World Sports Car Championship titles in 1985 and 1986, three 24 Hours of Daytona in 1986, 1987 and 1989 and five Le Mans victories in 1975, 1981, 1982, 1986 and 1987. Derek’s consistent team mate during this period was Jacky Ickx, racing several Porsche types together, including the Porsche 936, the Porsche 956 and the Porsche 962. The Bell/Ickx is partnership is considered as one of the most famous driver pairings in motorsport history. He was at his prime during the 1980’s and early 1990’s, becoming the most successful driver of all-time during the reign of the Porsche 956 and Porsche 962, achieving no fewer than 16 outright victories in the World Endurance Championship and 19 in the IMSA Camel GT Championship, a total of 35 wins in seven years. In 1970 Derek filmed the cult movie ‘Le Mans’ with Hollywood legend Steve McQueen, the two became firm friends. During the course of filming Derek showed that motorsport, even for the silver screen, can be a dangerous business, suffering burns to his face when the Ferrari 512 he was driving caught fire following a racing sequence on the Le Mans circuit. ‘We are delighted that this year’s Classic and Supercar Show was again able to benefit local Charities. The funds have been donated thanks to the voluntary work of the members of the Rotary Clubs of Yeo Vale, Sherborne Castles and Brue Valley. The recipients provide help for young people and the needy, contribute to vital medical research and services, help local organisations that care for the sick and those that work with young people. Organisers of the Show are thrilled to announce that ‘Porsche’ has been chosen for the 2019 marque feature. In conjunction with Porsche Centre Bournemouth the show will feature an historic line up of cars including race, rally and road cars from 1948 to the present day. Features manager Keith McGee said, “I have begun my search for show stopping Porsches from the early 356 series and all subsequent models through to the 959 and latest 911’s, the Carrera GT and 918 Hypercar. I am particularly keen to feature race and rally cars the ultimate being the iconic 917 Le Mans winning cars. If anyone has one of these occupying their garage do please get in touch”. 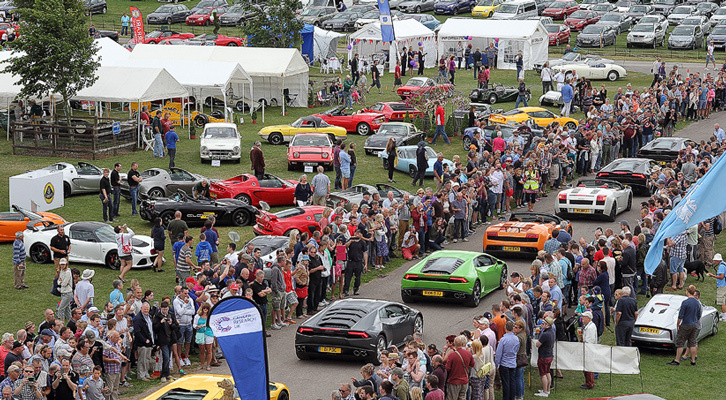 This prestigious charity event, taking place on Sunday 21st July, is now in its 16th year and regarded as one of the premier classic and supercar shows in the South of England. More than 2,000 vehicles will be exhibited including vintage, classic, rally, race, supercars, American, custom and hot rods. There will be over 150 trade, craft and Autojumble stands plus a Charterhouse car auction, live music in the catering village, amusements for children and beautiful picnic places. The show supports national and local charities and has raised £170,000 over the past five years. Don’t miss the match! We will have TV screens on site for exhibitors and visitors to our show, and you are welcome to stay and watch the match. We recognises that our visitors and supporters may well be pre-occupied with football this weekend, so we will be showing the Football Cup Final whether or not England are playing in it. The catering area will remain open until the end of the match, and you are welcome to stay and enjoy the football and good company with us. This is a special service we are making available to our exhibitors and legitimate visitors to our show to ensure that you can enjoy a full day of classic and supercars without missing out on the match. It is not an open invitation to the general public. The Trustees of the Sherborne Classic and Supercars CIO are thrilled to announce the Dorset and Somerset Air Ambulance as its Headline Charity for this year’s Show. The prestigious event held at Sherborne Castle is renowned for its fundraising efforts, after raising £130,000 over the past four years which has benefitted a range of local and national charities. The Dorset and Somerset Air Ambulance, launched in 2000, provides relief from sickness and injury to the people in the local area and to date has flown more than 12,500 missions. Its airbase is situated at Henstridge Airfield and the charity rely on the generosity of the public to help fund and sustain the great work it does. The Lancaster Insurance Classic & Supercars Show is regarded as one of the premier classic and supercar shows in the South of England. More than 2,000 vehicles will be exhibited including vintage, classic, rally, race, supercars, American, custom and hot rods. There will be over 150 trade, craft and autojumble stands plus a Charterhouse car auction, live music in the catering village, amusements for children and beautiful picnic places. With just a couple of weeks to go, the 15th annual Lancaster Insurance Classic & Supercars show on Sunday July 15, 2018 is revving up to be one of the best ever events. This year’s marque is Land Rover, which is celebrating its 70th anniversary as one of the UK’s most iconic brands. Amongst the many examples of classic and modern Land Rovers at the show will be the original 1948 prototype and a 1953 Land Rover Series 1, which was part of a fleet which accompanied the Queen and Prince Philip on a six month Commonwealth tour soon after the coronation. Another highlight of the show will be a visit by Paddy Hopkirk MBE. He is one of the greatest British rally drivers of all time, having competed in 283 events, and most famously for winning the 1964 Monte Carlo Rally in a Mini. The actual car will be at the show! Paddy will also be leading the Rally Car parade. There will be over 2,000 vehicles on display, with some very remarkable and eclectic examples, including the custom-built ‘Meteor Special’ that is powered by a 27 litre Meteor engine from a Centurion tank. Other vehicles at the show will include the ex Neslon Piquet Formula 1 Benneton and an original 1966 Ford GT40, over 40 Supercars including McLaren – Lamborghini – Noble – Ferrari – Aston Martin – Porsche and a host of interesting cars from the Haynes International Motor Museum. Numerous tours and parades will feature throughout the day and twice there will be an engine fire-up of the Benetton F1 car and some early 1900’s race cars. Alongside the familiar AutoJumble and Craft stalls will be the new Catering Village, where a superb array of high-quality artisan food and drink, together with music will be available in a single venue. However, for a truly exclusive experience why not become a ‘Member’ and turn your visit into a fantastic day out with access to unrivalled show facilities throughout the day – including a Buffet Luncheon in the Members Marquee on the East Lawn. Fun for the family is another focus for this year’s show. To ensure that the children don’t miss out on Land Rover’s 70th Birthday there will be the battery-powered ‘LittleLandies’, giving them the opportunity to try out the Land Rover experience! The Children’s Area provides a safe play area, particularly for younger children with a bouncy castle, slides, and roundabouts. Budding young racing drivers (and we are sure some adult ones as well) will again be able to test their skills on the slot car racing track. The custom built circuit is based on the Scalextric Digital system which allows up to 6 cars to race on a 2 slot track with lane change overtaking. There will also be remote control cars on a grass racing track. Live Music from Arcadia Jazz and Pantasy Steel Band will be performed throughout the show. 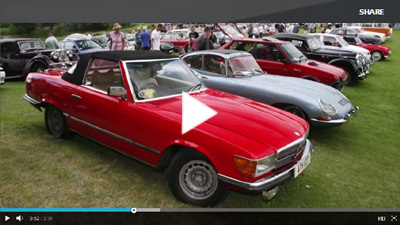 Charterhouse will again be running a fabulous auction for both Classic and Supercars. Charterhouse had the pleasure of conducting the first auction in the beautiful Castle grounds in 2009, which was very successful. Since then each subsequent auction has been built upon with hundreds of classic cars and motorcycles being sold – with a top price achieved by an Aston Martin DB6 restoration project for a not inconsiderable £150,000. We look forward to seeing you at Classic & Supercars 2018. Following the Royal wedding, organisers of the Lancaster Insurance Classic & Supercars Show are continuing to celebrate and are thrilled to welcome to the show a 1953 Land Rover Series 1 which has royal connections of its own! The show supports national and local charities and has raised £130,000 over the past four years.